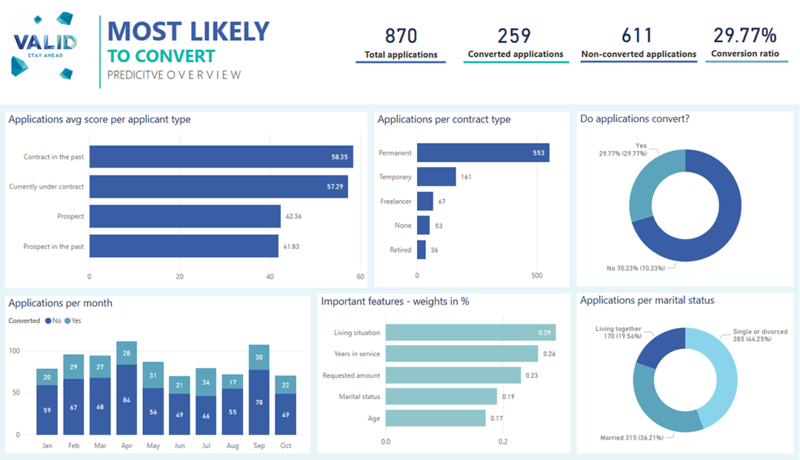 The "Most Likely to convert" solutions encompasses a mode that predicts which loan applications are most likely to be converted into definitive loans. The dashboard provide insights and helps answer business questions e.g. 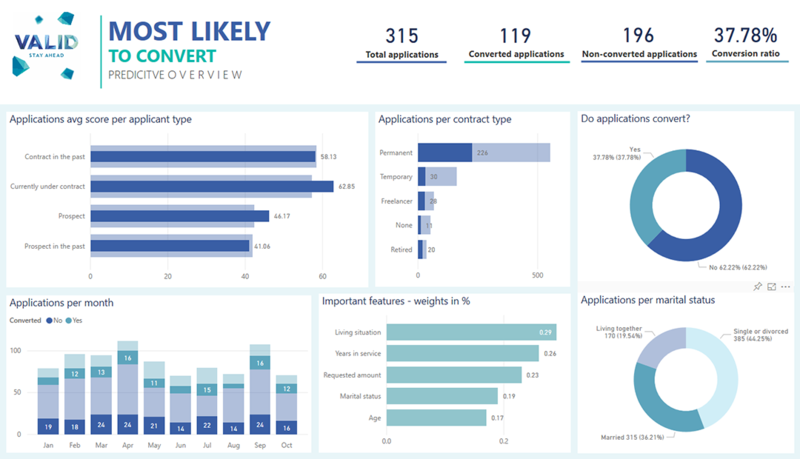 “which age group had the most converted applications?” The solution helps a company speed up its processes, increase its turnover and improve its profitability. For a financial institution we analyzed the process for loan applications. The institution wants to predict which loan applications are more likely to convert, meaning likely to become successfully approved by both parties. 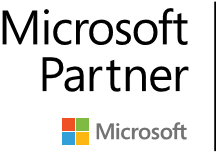 We analyzed three years of data (2015-2017) and created a predictive model using R and Azure Machine Learning studio. Our model uses a two-class classification algorithm to categorize (classify) any new application based on specific characteristics into one of the two classes, “YES” or “NO”. “Yes” means that the application was successful and got the loan and “NO” means that the application was cancelled or declined. Next to the class of a new application, the model calculates a predictive score (percentage). This percentage specifies in which class the application will fall into. the threshold is set at 50%. For instance, a new application gets a score of 23% of chance to be converted. This means that the application will be placed on the NO-class. On another case where an application gets a score higher than 50%, means that the application will fall in the YES-class. The goal of the predictive model is to help the financial institution make a decision based on the predictive score that every new application gets. For example, if a new application gets low score then they can contact the applicant and assist him/her to get the loan. Apart from the predictive power of our solution, we also have created a descriptive dashboard in Power BI. 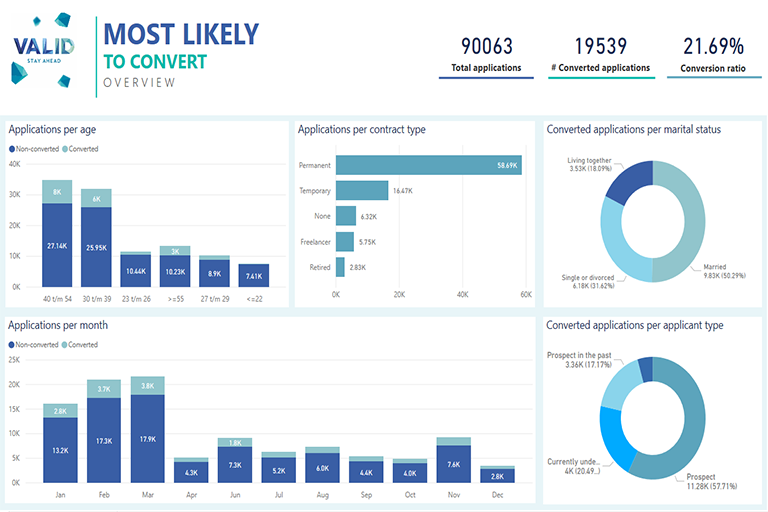 The provides useful insights into our and clients applications and answer business questions like, “which month had the highest conversion rate?” or “which age group had the most converted applications?” and many more. 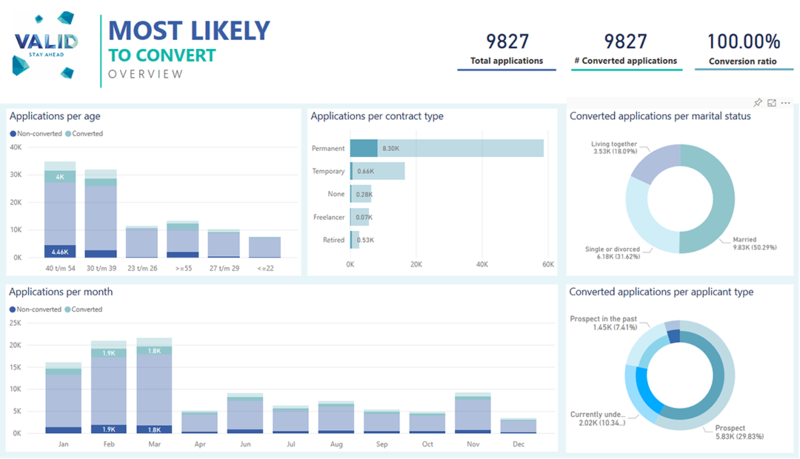 To conclude, every new application goes through our model and receives a percentage of how likely is to convert. In that way we know at an early stage of the application if it will be successful or not. Based on this score we can act accordingly.